Guitars: Ovation Celebrity from 1992, Taylor 314- KCE Fall Limited from 2000, Taylor T5 (which my husband got me after my first gig after having vocal cord surgery) my first Taylor which was a 1999 Mahogany Travel guitar, 1996 Sonic Blue Fender Strat, 2006 PRS Singlecut (another amazing gift from my thoughtful husband) 2007 Gibson Les Paul Classic Antique, 2010 Luna Fauna Dolphin, and the guitar my parents bought me for my 18th birthday: Yamaha FG-365 SII Dreadnaught from 1981 (it has the prettiest three piece mahogany back I have ever seen and extreme sentimental value!) I also have a Luna High Tide Ukulele and a Mahala Soprano uke that my brother bought me for my birthday last year. It’s adorable, looks like a Les Paul and sounds great! Favorite Artists/Bands: Renee Fleming, Pat Benatar, Barbra Streisand, Sarah McLachlan, Billy Joel, Queen, Paul Simon, Beatles, Jim Croce, Dire Straits, , Heart, Boston, John Denver, Dan Fogelberg, Cat Stevens, Harry Chapin, Reba McEntire, Shania Twain, Faith Hill. For newer music I love Green Day, Kelly Clarkson, Daughtry, Cold Play and Switchfoot and Broadway music from shows like Les Miz, Phantom, Wicked, Jekyll and Hyde etc. Favorite style(s) to play: That’s a hard one because up until the Gibson's Learn & Master guitar course I never considered myself a musician. I just played guitar to accompany myself singing etc. I always WANTED to play fingerstyle. I hope to still learn. Right now I am more comfortable playing with a pick and I’m excited that thanks to Steve and this course that I am finally playing in other places besides the first position. What made you want to play music? I was a very shy little girl but I always had a lot of thoughts in my head…feelings that needed to get out. I started writing poetry when I was very little; maybe 7 or younger. My mom always wrote little silly funny poems and even a few cowboy songs, as she likes to call them, (even though we were from Brooklyn!) She also introduced me to the Dr. Seuss books and then started reading Edgar Allen Poe to me on the subway to pass the time on our way to the orthodontist. I always tell everyone that my lyrical influences are: my mom, Dr. Seuss and Edgar Allen Poe! But when I was about 13 my mom gave me a hardcover book that was blank inside and that’s when I started to record my thoughts. I was ecstatic and felt like a published author. I naively showed my work to a teacher at a poetry camp the year before I started high school. She told me that great poets don’t rhyme their words and I was mortified because up until that point I thought that’s what I was going to become. Then a friend of mine introduced me to the acoustic guitar. I taught myself some chords (I was about 15) and suddenly I had an avenue for my words and good rhyming was a prerequisite…and that’s when it all changed for me. I would take my guitar to this pond in the back of my house (we moved from Brooklyn when I was 13) and I would play the guitar and sing to the ducks and make up songs that only they heard but made me feel so good inside. I felt like I always had a place to run to (even though the place was really inside my head.) My mom always told me that books are your friend and if you don’t have anyone to “play with” you can get engrossed in a book and you won’t be lonely. I took her love of reading and absorbed it but added “the guitar is my friend”…and it has been. The guitar has been there for me during the best and the worst times of my life…and never fails to make me feel better. You can’t ask for more than that from a best friend! Previous music experience: During college I was in a band called “Turning Point” and we never left my parent’s basement. I listen to some of the cassette recordings now and realize we should have tried to play out, but back then we never felt good enough. After college I actually forced myself to try out for a part in My Fair Lady. It was the first play my church ever put on. I closed my eyes during the audition and sang a song from the play. I was hoping to get into the chorus and was I surprised when they picked me for the lead! It was a very exciting time and I did about 3 other plays with that group. I got married in 1988 and had two beautiful sons. In 1993, I began work in a nursing home when my oldest was 19 months old. I was the Wandering Minstrel and Recreation Leader. The residents were so supportive of my music and always asked me to play the songs I wrote which was a thrill for me as I had never played for that many people before. But then in 1997 I developed a cyst on my vocal cords and lost my singing voice for 8 years. I could barely speak let alone sing so I went back to school and got my Master’s Degree in Elementary Education. In 2001, I sadly left the job that I loved but could no longer do and began a 10 year stint in education. I loved the children but I missed singing so much. Ironically I still wrote songs and played the guitar but not being able to sing them (like I heard them in my head) took most of the enjoyment out of it. But I never gave up on getting my voice back even after two doctors in 8 years told me that I needed vocal cord surgery but would most likely never sing again. They said I needed the surgery to restore my speaking voice (as it was extremely hoarse and difficult to project) In 2005 I found a voice doctor who told me differently! He was only one of about 50 in the whole nation that performed this type of corrective surgery. In Sept of 2005 I had successful vocal cord surgery. After complete voice rest for one month and 6 months of weekly speech therapy my singing voice was better than before. My family has been so supportive of my returning to the music so easily could have been lost for good. 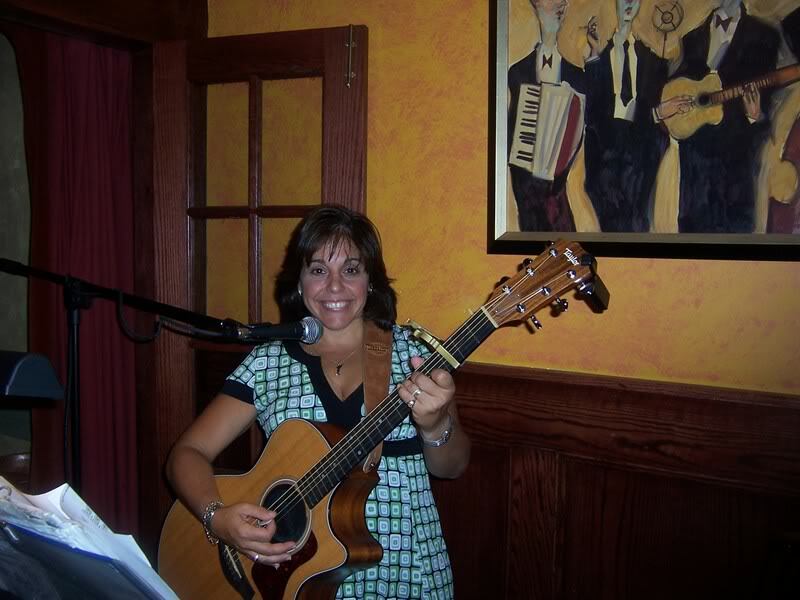 I released a CD that my brother George helped me produce called “Moments of Happiness.” (get it on iTunes - Moments of Happiness - Maria Calfa-DePaul) In 2006. I was honored to be recognized with a top 4 placement as a Finalist in the Christian/Gospel Category in the International Song of the Year contest for one of the songs on the CD called "Silent Prayer." I’m excited to say that I sold 251 copies of "Moments of Happiness" to friends, family and even a few strangers.Although it’s not a household album, creating it was a dream of mine. My son’s are so cute. They told me “It didn’t go Gold or Platinum, it went ALUMINUM!” Hey, after not singing for 8 years and thinking I might never sing again; I’ll take Aluminum! If your house was on fire, which instrument would you grab? Well thank God I have two hands because it would have to be my Taylor 314KCE and the Yamaha. The Taylor is the easiest, best sounding and most versatile guitar I own. Also, I got it 11 years ago when my husband and I went to rent a violin for my son who was in 4th grade at the time. I told him that I just had to have him “listen” to this guitar that I had played a few times. I just couldn’t get over how easy it was to play AND how pretty it sounded. Well while I was paying for the rental he was paying for that guitar without my knowing it and I was astounded. It sounds even better today. The Yamaha means so much to me because my parents bought it for me even when they didn’t have a lot of money. They invested in a really decent guitar for me to play and I will never forget that. I still remember going with them to the music store. That was the first real guitar I owned. The one I learned on was a free one that my dad got me with cigar bands. It was a Yamaha but it would never stay in tune and it was soooo hard to fret. My brother was ahead of his time; he had my dad saw the neck off the first guitar so he could practice fretting! What is your favorite place to be when playing guitar? Hands down: outside. I just love to be outside. I always tell everyone I wish I could clean my house outside… There is nothing like going on my little bench in the front of my house. It’s in front of a huge rock and under a tree and it’s so peaceful. I love when I see the squirrels and rabbits running around and the birds fly by and some stop and sing with me (well I like to think that)! I have written my best songs outside. What has been your highest, most delightful musical moment so far? After losing my voice for 8 years; every time I open my mouth to sing I feel a rush… but two other moments come to mind. One is from way before I lost my voice and one is from a few years ago. The first was when I was in my junior year in high school. Up until that point I was too shy to ever perform in public. I had written a song for a boy from our class that died in a car accident that year. The school had a week long event called “Music in our school’s week” I waited for two days for the music teacher to pick me but because she never heard me sing, I guess she was reticent, so I didn’t get picked. During the last period of the day; with only one day left of performances, a boy literally pushed me out and said that I hadn’t gotten a chance to sing. I was so nervous but I kept focused and sang the song. It was called “Blind Fools.” I sang most of it with my eyes closed but when I opened them I saw all of these students (boys and girls alike) crying and the teachers too. I realized then and there the power that words and music can have on people. And afterwards, the music teacher who didn’t want me to sing had me sing for the next class and all of the classes the next day. When it was over one of my other teachers baked me a cake and we had a party...I felt so alive and felt that this was what I was meant to do. The other top ten memory happened about 3 years ago. I was doing a “Songwriter’s Circle” at the local public library and I had the opportunity to sing a song I wrote for my parents 36th wedding anniversary (view the video here). They were married 58 years at that time and having them in the audience along with my sons was amazing! They got all choked up and I felt so blessed that after all those years of not being able to sing that I could sing it for them and have other people feel what I felt and relate. It was a special moment and once again reinforced for me the power and beauty of music. Hobbies: Playing guitar, and ukulele, writing songs, recording music. I also write instrumental compositions on my keyboard that probably have the great composers turning in their graves (because I’m sure I break every classical rule there is) but I just have fun making up melodies and intertwining different lines and layers of instruments. I also like to read (lately it’s been mostly music theory books.) I enjoy hiking with my family and taking walks with them and my dog on a path that follows the Hudson River. When time and money allow my husband and I enjoy going to the Metropolitan Opera in Manhattan. I have been honored to see my favorite opera singer: Renee Fleming in 5 operas and getting to meet her back stage almost as many times! Opera is so different from any music I can play or sing but it reaches a part of my soul that nothing else has been able to. My absolute favorite song is “Ich ging zu ihm" by Korngold; sung by Fleming and it makes me cry every time I listen to it and I don’t understand a single word. It truly is the marriage of her voice and the music and the way the lyrics are sung that reach into me and speak to my condition. Current Job: My job teaching elementary school recently ended and I’m looking at it as an opportunity to devote my time to taking care of my elderly parents (they are 86 and my moms legally blind) as well as time to truly learn and master the guitar (and with Steve and the forums help, I’m well on my way!) 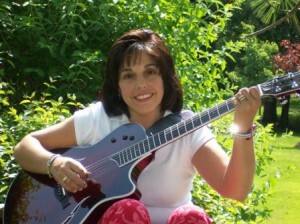 I’m also to trying to get back into the gigging and recording of my next CD. I already have all of the songs written and some recorded but it’s no where near completion. The title of the CD and one of the songs is called “Almost Beautiful.” One of my long range goals is to have other artists record my original songs. It’s been a dream of mine for many years and I hope someday it becomes a reality!